The folks at Anchor Distilling Company (Alan Kropf, specifically) interviewed me for their Educational Drinking Show. Here’s 35-or-so minutes of me talking about why I think Tiki Is a Big Deal. 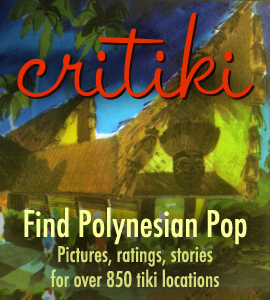 I talk about how I got into tiki, what I love in a tiki bar, how some of the newer establishments miss the forest for the trees, why it matters that tiki bars are dark, how I think Polynesian restaurants changed the way Americans eat, what it was like in the early days of the tiki revival, and how you can use some great books and Critiki to dive into the world of Tiki. Mahalo, Alan & Anchor Distilling Company! What a great interview! Thanks for the book recommendations! That was really, really good Humu. You explained everything so well and your jazz analogy was absolutely spot on, and IMO, what is sadly so wrong with tiki now that it has become so popular. Besides reading the books you mentioned, every newbie should watch this interview and then hopefully learn something from it.